Bringing groovy blues with an African flavour, Eric Bibb returns to soothe our souls with his deep, smooth voice on this colourful record, Global Griot. Alongside the Malian Habib Koité and the Senegalese Solo Cissokho, he brings us 25 songs from the borders of gospel and reggae (Wherza Money At). This is an album that takes you on a journey, and the destination is clear: Africa. The word "Griot" in the title refers to African musicians, and more precisely to the “traditional communicators”. 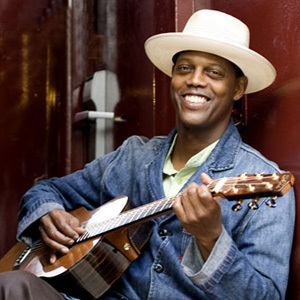 The word is rich with history and Eric Bibb treats it with respect. Be they Americans, Europeans or Jamaicans, the artists brought together on this album manage to include all manner of influences. The album also has a folky side and many of the themes of the album focus on human beings. Global Griot echoes the sound of the album he recorded in collaboration with his wife Ulrika, Pray Sing Love. The New Yorker never tires of musical declarations of love, or indeed of political songs, here he covers Big Bill Broonzy, Black Brown and White. He performs this alongside Harrison Kennedy and the pair give a terrifically lively rendition of the track.